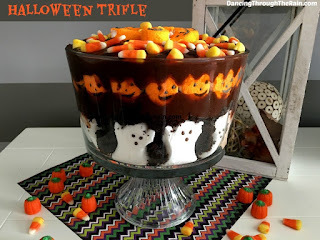 While searching for a creative, yet easy Halloween dessert, I came across Alli Doubek's fabulous Pumpkins & Ghosts Halloween Trifle. This is such a clever way to use those awesome Peeps ghosts and pumpkins that show up each year in the grocery store for Halloween. Alli takes it a step further though by using chocolate pudding and cake as the trifle filling. Therefore, her awesome creation is easy, beautiful and delicious! Grab you deep trifle bowl and get ready to have some fun! In a little over 1 hour, you can make this fabulous Halloween trifle for your Halloween party, or just as your family Halloween dessert. 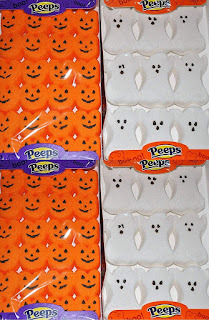 The store bought marshmallow Peeps shaped like ghost and pumpkins stand out beautifully with the dark background of chocolate pudding and cake. There is just the right combination of spooky and cute to be the perfect treat for children, and adults, for Halloween. Of course, you can choose a different filling for the trifle, but this simple trifle idea is fabulous regardless of the cake filler recipe you elect to use. Making the trifle is pretty simple and straight forward. You get the gist by just looking at the photo of her finished trifle. However, be sure to visit Alli's website, Dancing Through the Rain, for complete instructions and tips. This Halloween trifle recipe would be easy enough to make that you could even let your children help. It would be lots of fun for all of you and another great Halloween childhood memory for them. Just be careful, your marshmallow pumpkins and ghosts might start disappearing right before you eyes! Here is an awesome idea for a summer party, team party or really any time for football fans! Everybody loves ice cream, especially on a hot day. Ice cream sandwiches are always a popular choice for kids and adults alike. 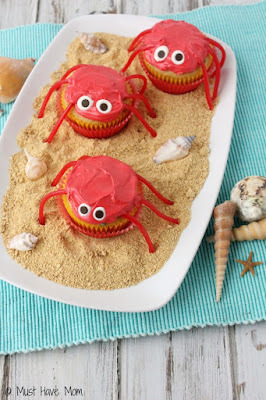 They are the perfect pool side or party treat. Ice cream sandwiches decorated to resemble a football would be great as a snack for your little football player. Or, even the whole team after practice. 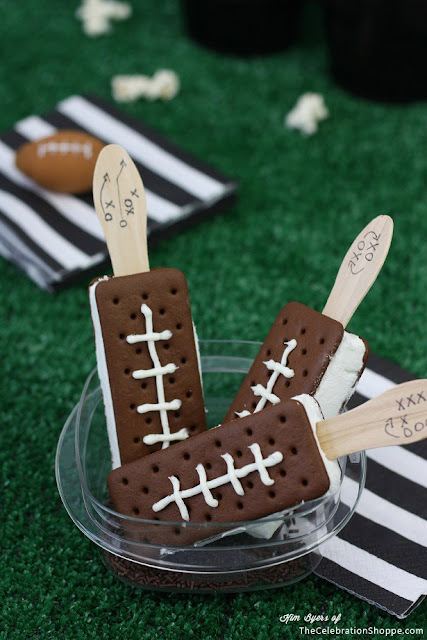 These ice cream football sandwiches are not only adorable, but they are really easy to make. 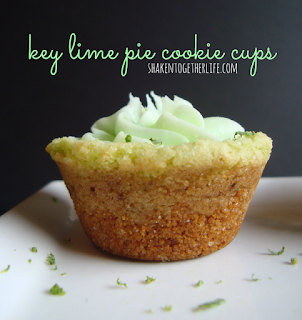 This fun treat recipe was originally published by Kim Byers on The Celebration Shoppe. She recommended them for a Super Bowl party, which is truly a great suggestion. I love her idea to draw football plays on the wooden spoons that are used as "sticks" for this ice cream treat. Kim shares really easy to follow instructions in her article. You can probably guess how to create these ice cream football sandwiches by simply looking at her photo, but it is still worthwhile to check out her suggestions. She offers alternate decorating options, as well as freezing and storage tips. I, myself, was surprised to read that the decorated ice cream sandwiches could last up to 30 minutes. Of course, I doubt any football player would ever let one sit for that long! But, you may wish to take the treats to the boys, so it is good to know. With mini ice sandwiches purchased from the store, a few lines of icing for each sandwich, and wooden spoons, you too can make these totally awesome game day treats. You will certainly be appreciated and hailed as a very creative mom. Very cool indeed! Be sure to check out Kim's other great party ideas, as well as her original recipe online at The Celebration Shoppe. Cupcake cakes are really awesome and the Pumpkin Cupcake Cake is truly fabulous! A wonderful Fun Food for Halloween. This may look like a lumpy cake, but in fact it is 24 cupcakes put together to create the cake. I love cupcake pull apart cakes simply because they are so very easy to serve. Because cupcakes are already individual serving size, guests can pull a cupcake away from the cake without having the mess of cutting a cake. The entire tutorial with lots of pictures can be found on Cooking for the Holidays. There is also a list of supplies provided, but aside from the cupcakes and frosting very little else is needed to create this cool pull-apart cake. The design may seem straight forward by simply looking at the photo, but there are a few tips provided in the tutorial that definitely make decorating easier. There is also a diagram of how to arrange the cupcakes by size to make the cake. As you can see, the cupcakes are arranged and then frosted to give the appearance of a cake. Frosting it that way allows you to decorate it like you would a cake. 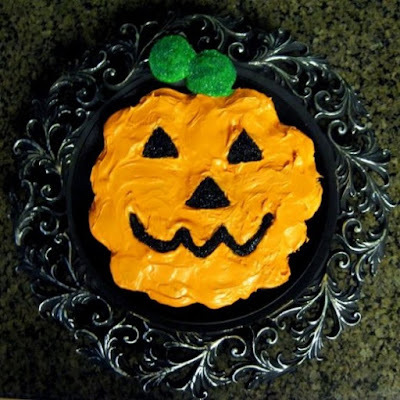 If you take a close look at this pumpkin "cake" photo, you will see that the mouth crosses several cupcakes, but finishes the pumpkin face design. This Pumpkin Cupcake Cake is easy to prepare and serve! I especially like the Pumpkin Cupcake cake for children. 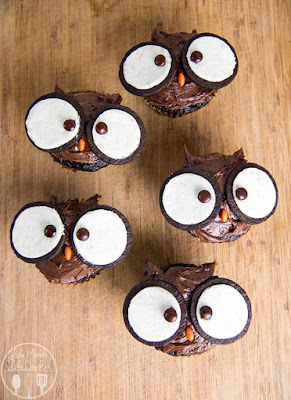 It isn't scary at all, yet is perfect for a Halloween party or dessert. It is cute enough that even little children will like the smiling jack-o-lantern. This Halloween Pumpkin Cupcake Cake is truly a treat for everyone, including the hostess. 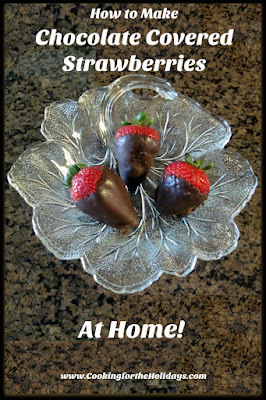 Just about everybody loves chocolate covered strawberries, but few people realize you can make them yourself at home. Chocolate covered strawberries have become a favorite to include in picnic baskets, to buy as a special gift for your sweetheart, or to treat yourself with a sweet tidbit. 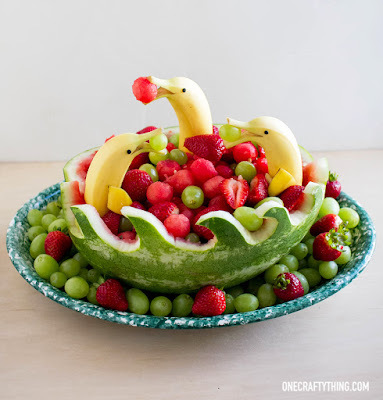 They have also become a big part of edible arrangements which are often used for special occasions. Personally, I enjoy including them on my fruit trays for my friends who love chocolate. Because chocolate covered strawberries are so expensive, we limit ourselves to only a few at a time when we buy them at a candy store. Our local candy store sells them individually, or in prepackaged boxes of 6, for a very hefty price. Then, we try to make them last as long as possible. When I figured out how to make my own chocolate covered strawberries, I wanted to kick myself for the wasted money on store bought. It is actually very easy to make them, but there are a few tips for ingredients and techniques. One really important tip is to make sure strawberries are in season. In the United States, that is typically during the months of April through August. Fresh strawberries make the best chocolate covered strawberries. You will want to wash the strawberries and completely dry them with paper towels before you dip them in melted chocolate. Visit Cooking for the Holidays for all of the tips for making your own chocolate covered strawberries. In that article I share my preferred chocolate, as well as tips based on my own experience making this fabulous chocolate delicacy. 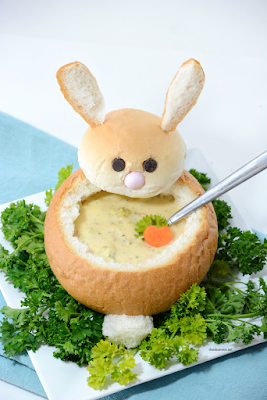 One of the cutest Fun Foods for Easter that I have ever seen is the Bunny Bread Bowl created by Amy of The Idea Room. 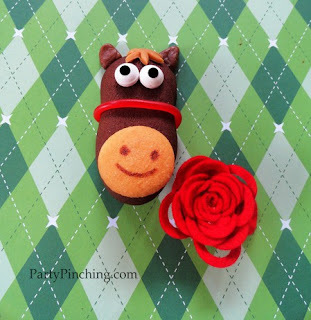 Not only is it adorable, it is truly perfect for holding thick soup, chili or a salad. I absolutely love it! It is sure to delight both adults and children. Just seeing the little bunny makes you smile. Amy gives us easy written directions, as well as a video on how to make these awesome Bunny Bread Bowls ourselves. She truly makes it look very simply, Especially, since she uses store bought bread. It is literally as simply as constructing the bunny bowl. If you are not in a hurry, you can certainly make your own bread bowls. With simple ingredients of warm water, yeast, sugar, olive oil, salt and flour, TessaArias shows us just how easy it is to make our own bread dough for bread bowls. She give excellent step by step instructions and details in the video below. She even shows us exactly how to properly press, divide, roll and shape the dough, as well as giving baking tips for a golden glow on the baked bread. Her recipe makes 6 bread bowls. 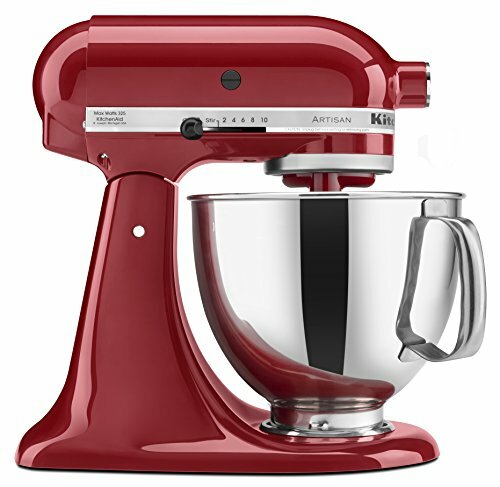 Most stand mixers come with bread dough hooks, but that is very misleading. Often they are simply not sturdy enough to really mix and knead bread dough. They mixer motor may be fine, but the mixer itself will jump around on the kitchen counter simply because it is truly not heavy enough for making bread dough. If you plan to make your own homemade bread, you will want to invest in a sturdy bread dough mixer like an KitchenAid. The are available in a variety of colors to match your kitchen decor. If you are looking for a really fun and easy Christmas treat, then you are going to love this Christmas Wreath Marshmallow Treats recipe! You really can't mess the design up, so you could even let the kids help you decorate the wreaths. Plus, the red and green colors are perfect to serve during the holidays. They make a really pretty addition to any table. Whether you are searching for a snack, an appetizer, or a light dessert, these Christmas wreaths would have you covered. You can also make them ahead of time and freeze them. 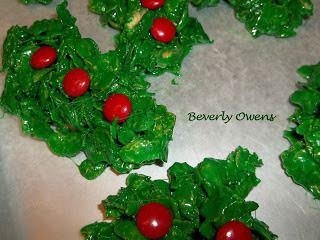 Bev Owens published the recipe for the Christmas Wreath Marshmallow Treats on Review This! You can find her recipe and all of her great tips there. I always prefer a recipe that is simple and one that you most often have all the ingredients on hand without having to run to the grocery store. Since the Marshmallow Christmas Wreaths recipe is a combination of cereal, marshmallows, M&M's, food coloring, butter and vanilla, it is unlikely this recipe would send us out to gather supplies. Especially at Christmas. I might not always have M&M's on hand, but I do during the holidays. I suspect that is true for most of us. You can take the time to form these treats in the round wreath shape or you could make it easier on yourself and use the elongated wreath shape shown in the photos. The elongated wreath really does make a nice cover up for any mistakes too. A combination of shapes would be truly fantastic and look completely planned too. This really is a fun recipe for several people to make together. It is actually good to have helpers since the mixture starts to set pretty quickly as it cools. I am always searching for fast and easy recipes for Christmas! 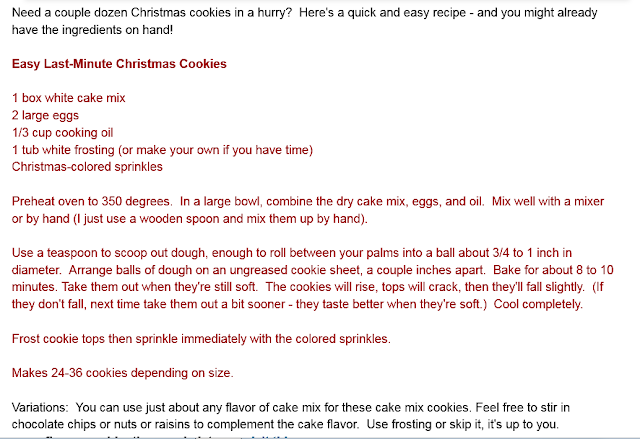 I found this Christmas cookie recipe on "Recipes for Real People" and thought how perfect these cookies are to share on the Fun Food Guide. Since this is a quick and easy recipe, it will no doubt quickly become one of your favorites too! Not only are they "quick and easy" but they are delicious! The recipe calls for a white cake mix, but Susan, the owner of Recipes for Real People, assures us that we can use any flavor of cake mix to create our own favorite cookie variety. Most of the ingredients needed to make these last minute Christmas cookies will be supplies we often have on hand during the holidays, especially if you happen to have the sprinkles already. 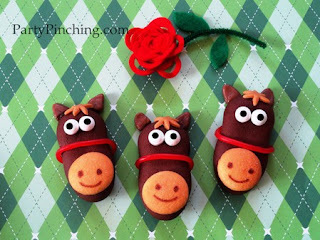 These cookies would be really fun to bake and then let the kids help decorate. Children always enjoy being able to say they decorated the treats, and adults always rave over the kids talent in design. These Christmas cookies would be the perfect gift for neighbors, family and friends who are either hard to buy for, already have everything, or who you simply wish to remember with a gift of food for the holidays. Baked goods are always appreciated because they are so easy for the recipient to pull out and serve to their own guests. Also, delicious Christmas cookies like these are always perfect for a cookie exchange or to send to your child's school Christmas party! Whether you are baking these cookies for yourself, or to give as a gift, I am certain you will love this recipe as much as I do. After this article was published, Susan Deppner's Website was taken down due to her death after her last battle with cancer. 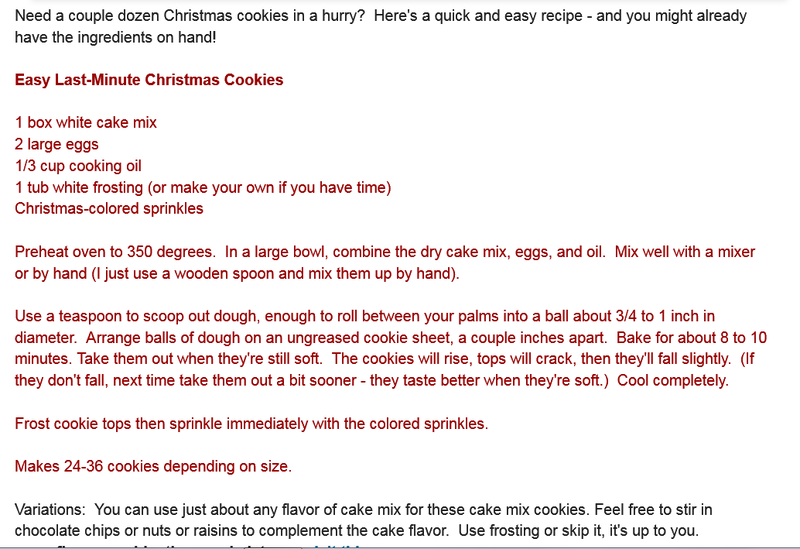 Here is a screen shot of Susan's original recipe page! Kids always love creating cool things and that includes really neat Halloween cakes! This fabulous Halloween Ghost Train cake would be perfect for kids to create with a little help from Mom or Dad. Assembling it would be a really fun activity that you could share with your children. Not only will you be creating an awesome Halloween dessert, but you will be making memories that will be cherished forever. Oh! And, did I mention that it is chocolate?!! Plus, it is no-bake which makes it the perfect cake idea for children to help make. 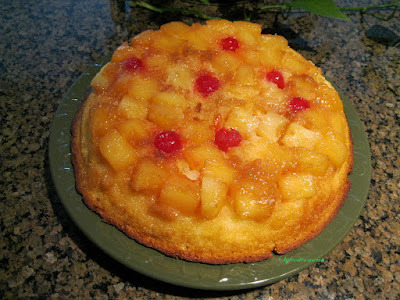 This is a very easy cake to assemble. Simply purchase the needed ingredients and start building your own Halloween Ghost Train cake. The shaped peeps and bat brownies really add the finishing touches to make it purely Halloween. You will want to be sure to buy extra candy because it is truly impossible to resist snacking while you create. By simply looking at the photo, you will be able to see a lot of the ingredients required to make this wonderful ghost train cake. However, you will find the complete list of supplies and the step by step tutorial with lots of photos published exclusively on Cooking for the Holidays. I can assure you, it is a really fun cake to assemble and a delicious cake to eat. My son has always loved trains. When he was very young, we used to seek out trains for him to watch speed by. This Halloween ghost train cake was a pure delight to design with him and brought back a lot of great memories for both of us. I know for a fact that children will love this train! 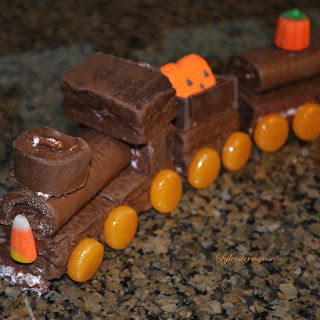 The Halloween Ghost Train Cake image & tutorial published on Cooking for the Holidays. I love Halloween and all of the fabulous Halloween cakes, cupcakes and special treats. This Graveyard Cake would be an awesome cake choice for any Halloween party. It is eerie without being grotesque. Plus, it is chocolate! Jade has given us easy to follow instructions on exactly how to decorate this creative Graveyard Cake. You will be amazed at how simple it is to recreate and how little decorating experience is required. I want to start by saying that I love the grated chocolate idea. 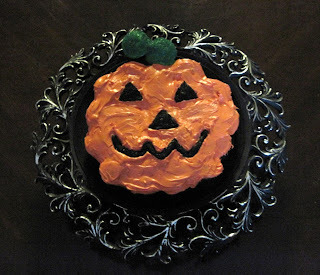 It would be great for any Halloween cake to give a textured foundation or background for the Halloween scene. If you are planning a children's party, you might want to use the grated chocolate background idea and add Friendly Ghost Rings which would also double as party favors. Everything about decorating the Graveyard cake as shown is basic and easy. Jade uses sugar cookie dough, lady fingers and jelly to create this phenomenal graveyard scene. But the very best part, it would be delicious to eat! Although, admittedly, I might be hesitant to bite down on a finger. They just look so realistic!!! Sometimes we need to be able to take a few shortcuts when we are hosting a Halloween party. Jade suggests that you could purchase a store bought chocolate cake to decorate, but she also provides a homemade cake recipe in case you have the time to bake and decorate. You will find Jade's step by step instructions for making this unique graveyard cake, as well as her additional tips on her site, Homemade by Jade. 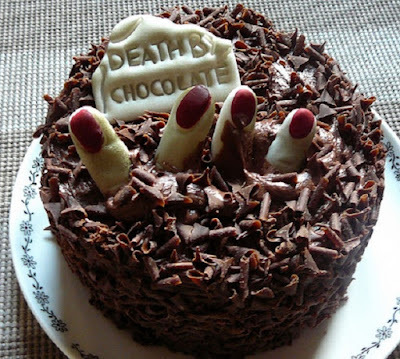 You will also love her witty tutorial title, "Graveyard Cake - The Perfect Finger Food"! The Graveyard Cake image, recipe & tutorial published on Homemade by Jade Blog.